Moving with kids is always a little challenging, especially if they are resistant to the move itself. The trick is to prepare them for moving then get them involved. By staying involved in the process, they'll feel they're part of a team and more in control of a situation where they sometimes feel helpless. First, tell your child about the move. Prepare them for moving. Get them involved; hold family meetings; have moving discussions. Use this book list to purchase or loan books from the library to help kids understand their feelings about the move. Once your child knows about the move, the next step is to help them get ready and prepared and the first thing to do is to take them to the office supply store to pick up fun materials for them to use to pack their stuff. Pick up colorful stickers, markers, a journal or diary to record their experience, boxes, packing tape and plastic bins, if you prefer to pack without cardboard boxes. Be aware that children will try to hold onto their things a little more tightly than they usually would. Moving is all about change and the more their lives are changing, the tighter they'll hold on to the things they can. Take time to go through their bedroom with them to help them decide what to keep and what to give away. If possible, provide older children with room dimensions so they can plan their own space. Describe what things their room will hold or if new furniture may be needed. Try to get them to imagine their new space and start to design how they'd like their new room to look This will help them sort and select the items they want to keep for their new spaces. Go through their toys, books and clothes with them to determine what belongs in the "keep pile" and what belongs in the "sell or donate" pile. You may also want to decide at this point which pieces of furniture will be moved. Go through their room with them, giving instructions on what needs to be sorted, the rules around why something gets moved and ask them to make their own keep and donate piles. Allow older children to do as much of the sorting and packing of their bedroom as possible. Try to be tolerant of their decisions and respect their spaces. Again, provide them with keep and donate bins so they can sort their things accordingly. Provide them with plastic bins where they can store the things they want to sell or donate. Try to get children excited or interested in donating their items to a local charity or selling stuff online in a garage sale. After they've made their piles, go through both to ensure they're giving away what's appropriate and not keeping things they don't need. Make sure you remain sensitive to what they're asking to keep. Their essentials box should contain all those things they'll need for the trip to the new house and for the first few nights. This box won't contain clothes or toiletries, but items that they want to keep them occupied or to remind them of their old home. Most children pack a few books, activity books, puzzles, address books, diaries or handheld computer games. Pack their clothes, shoes and practical items they'll need first. Make sure you include enough supplies for the trip and for a few nights at the new place. This will allow time for the moving truck to arrive and/or for unpacking of boxes. Depending on your child's age, you may need to do most of the packing. 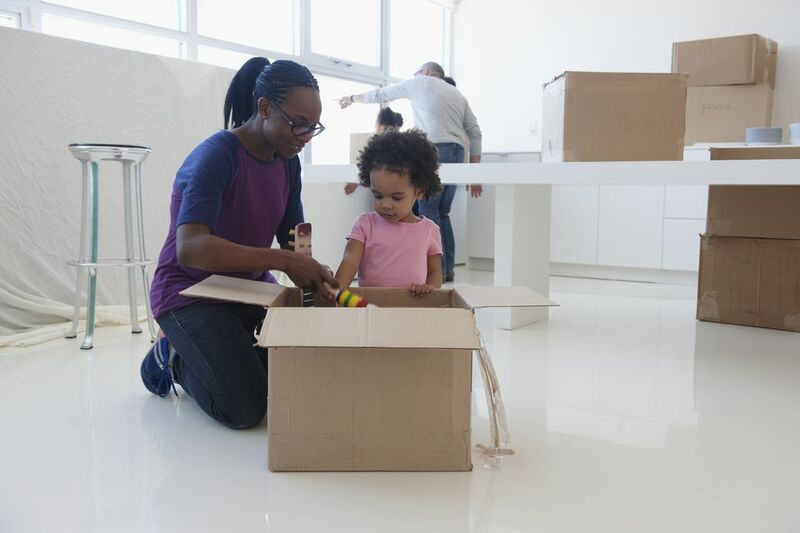 Even if you have a very young child, you can ask them to label or decorate the packed boxes or help seal them with the packing tape. Older children can do a lot of their own packing - just make sure they have instructions on how to pack things, making sure you're close at hand for questions or concerns. Make sure that all liquids are properly closed or emptied before they're packed. Squirt guns, chemistry sets and paints all need to be checked before being packed.